Out of ammo and out of time, you make your last stand against the zombie hordes! The food ran out about a week ago. The water, just the other day. That’s it. Game over, man. A sarcastic smile crosses your face as you consider how long and hard you fought the undead only to come down to this: a starved, terribly thirsty, “survivor” who is about to be just another victim. Dang, that’s not the way you wanted it to end. Sad, really. Whatever. That’s loser talk. Fine. If that’s the way it’s going to be, so be it. You’ve got a handful of bullets left and enough spit and vinegar to keep fighting. If you’re going down, you are going to take as many of them with you as possible! Time for the finale! 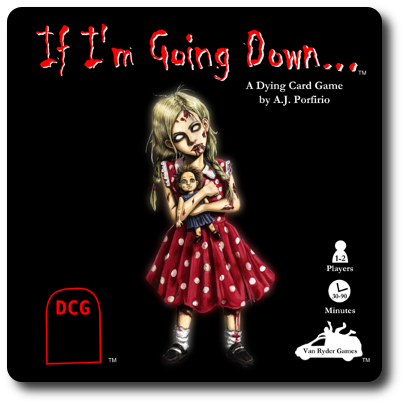 If I’m Going Down, by Van Ryder Games, is comprised of 55 Zombie cards, 41 Fate cards, 6 Character cards, 6 Inventory Tracker cards (2 ground, 2 hand, and 2 body), 50 tokens (representing damage and various player predicaments), 3 large Scenario cards (double-sided), 2 large Turn Reference cards (double-sided), 1 large Zombie Ability Reference card, and 1 Scenario book. The artwork and book layout is superb. And by superb, I mean exceedingly professional and terrifying. The zombie illustrations are of the highest quality and will give you nightmares. Not included in the game, but necessary to play, is a pad of paper and a pencil or a couple of 10-sided dice to help keep score. 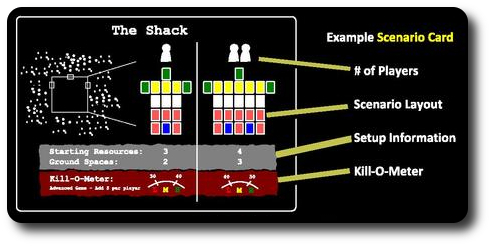 To set up the game, select either the Intersection or the Shack game set up Scenario card. Both cards are used for a 1 or 2-player game, but the set up will differ slightly in regards to initial card placement. The Scenario cards detail these changes, however, and won’t be an issue. 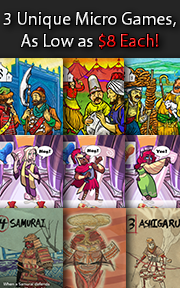 There is a third Scenario card available for a 3 to 4-player game, but this cannot be used unless a 2nd copy of the game is added. Note that the Scenario cards are used even if the Scenario book is not. Second, each player will now select a Character card (or just randomly select one). Each player should read this card to make sure they understand the character’s unique special ability and then place it (Human side up) on the noted starting space for the scenario. At this time, all the players should collect 1 ground, 1 body, and 1 hand Inventory Tracker card, too, placing the cards in front of them. Note that the ground Inventory Tracker is shared between the players (there’s only one “ground”, after all). 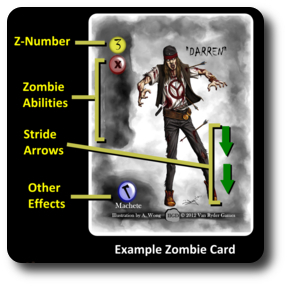 Third, shuffle the Zombie deck and evenly distribute the deck, face-down, on the noted entry points. The entry points represent where the Zombie cards will appear and from what direction they will shamble. Now is also a good time to point out that the back of the rules and Scenario book have card spacer images to help the players set up the playing area. Very handy! Fourth, take the Fate deck and find the Story Item card. Set this card aside and then give the entire Fate deck a good shuffle. Now draw 3 cards at random. This represents the starting weapons and equipment the player has or knows about. Any “No Luck” cards that are drawn should be ignored and placed in the Fate deck’s discard pile. After 3 weapons or equipment have been drawn, place the Fate deck, face-down, next to the players. Note that the number of starting resources is different if playing a scenario. Fifth, now place the starting resources you drew from the Fate deck on the character Inventory Tracker cards. If playing a 2-player game, both players must agree to the initial placement of the weapons and equipment before continuing to the next step. Note that players always start with an equal number of resources, but the resources themselves might not be equal in measure. For example, it is perfectly fair that one player starts with an automatic rifle and another player to only have a pointy stick. Be sure to check the scenario for specifics. Sixth, place the game tokens and reference cards to one side and within easy reach of all the players. Note: While the game is not that difficult, the rules and game play can be rather involved at times. We will only summarize the game play here and encourage you to read the full rules to learn more about the many little intricate details that are included as part of the game mechanism that bring the undead to life. The game is played in rounds with each round further broken down into 4 specific phases. These phases are summarized here. Here come the zombies! 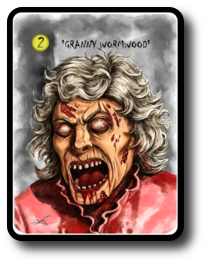 A Zombie card is placed in an available initial space. Initial entry points are noted by the scenario set up. Each player now has an opportunity to take 2 actions, which can be done in any player order and repeated. Search for Resources: Player draws a card from the Fate deck. If it is a usable resource, the player must now place it on one of the Inventory Trackers, discarding a currently available resource if necessary. Or, if the resource isn’t of much use, it can be discarded instead. Manage Resources: Players can toss equipment back and forth to each other, equip new items, drop others, and even throw away items that are no longer of use. Players can swap, trade, discard, or move (up to 2) pieces of equipment using a single action. Note that a character cannot equip an item if they do not have any hands free. Use a Resource: Players can use a resource, doing as the card says. If it is a weapon, the player will be attacking a zombie and adjusting the number of times it can be used by shifting it on the Inventory Tracker card. For more on combat, see the “KEEP FIRING!” section below. Now the zombies advance. All zombies still walking around move towards the characters by at least 1 card space if possible. 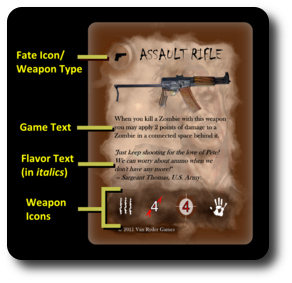 Use the back of the rules and Scenario book as a card spacing guide. Some weapons have a count that determines the number of times it can be used before it is no longer useful. This could be anywhere from 5 to 1. Simple weapons, such as swords and bats, can be used indefinitely Whenever a weapon is going to be used, it is first moved on the Inventory Tracker card. Once a firearm is out of ammo, it becomes useless unless a player finds more ammo. Some weapons allow for a player to attack more than one target or the same target multiple times using only one action. For example, the assault rifle allows a player to squeeze off 4 attacks during a single action. This is useful because it allows a single player to become a one-person-fighting-force if they are using a weapon that allows for a number of different targets in a single round. When attacking, a player must first choose and declare a target. Simply stating, “I attack a zombie” doesn’t cut it. The player needs to point out what the target is. This is important for two reasons. First, when playing a 2-player game, the other player might have a suggestion or two on which zombie should be blown away. Second, range counts and some zombies cannot be hit or are harder to hit if certain conditions apply. For example, a zombie could be exceedingly short which will make it impossible to hit if another zombie is standing in front of it. Knowing your target is just as important as knowing what’s around your target. The game isn’t being timed, so players should feel free to discuss their attacks before continuing. Once the target is decided, the player can attack. To determine if the attack hits, the player draws and reveals one Fate card. If the Fate card shows any icon other than the “No Luck” icon (which is an “X”), the hit succeeds. Regardless, the drawn Fate card is placed in the discard pile. A Fate card that shows an icon of a blood splat kills the zombie instantly, regardless of damage (HEADSHOT!). The amount of damage (referred to as “Kill Points”) is equal to the weapon’s Attack Rating, plus any Attack Modifications. If the Kill Points is equal to or greater than the combined value of a zombie’s Z-Number (the zombie’s health) and any range modifiers, the Zombie card is removed. Be sure to record the number of zombies that are killed during the game, along with any bonus points. Zombie combat is much more straight forward with, obviously, a lot less thinking involved. The first step is to determine if any Zombie card is in the scenario’s defined Danger Zone. The Danger Zone is any space adjacent to a Character card. If there are none, then there is no zombie combat. If a Zombie card is adjacent to a Character card, that means it is within melee range to possibly inflict damage with its teeth and nails. But before the zombie can event attempt a cat scratch, the player can attempt to hold the zombie back automatically. Thematically speaking, think of this as the character pushing the zombie back without doing any damage. It buys the character time, but not much. However, not all zombie can be pushed around, nor can a zombie be pushed back twice. If the zombie cannot be held back, it does what a zombie does best: attack. The adjacent character is automatically bitten. Additionally, some zombies have the ability to reach over their undead brethren and attack a character from afar. Yikes! There are two types of wounds that can be inflicted on a character during the game. These are scratches and bites. Players get scratched all the time, but these are not life threatening and will not hurt a character. Being bitten once during the game does not end the story of the character, either. They can continue to fight, but they will become a zombie later on. If a player is bitten twice, that’s it. The zombies jump on the character and start to pull them apart. All the resources the now eaten character once held remain on the Inventory Tracker cards (meaning, if they held a gun, they still do, it’s just that the hand that is holding it is no longer attached to the body). From the surviving character’s perspective, all the resources that were held by the now dead character, are on the ground. Lastly, and perhaps the most horrific of all, the character card is flipped over to reveal the undead state of the once living character. This is now a Zombie card and cannot be controlled. When a character falls, record the number of Zombie cards in play that have a the “Moan” icon. These count as negative points at the end of the game. From here on out, things go downhill really fast for a lone surviving character…. The game ends as soon as all the characters have perished. Players should not grieve over the violent demise of their character as their death was impossible to avoid. There is no victory, per se, but the game does keep track of the player’s ability to survive. At the end of the game, tally up the number of points earned from killing zombies and reduce any points that were recorded. The final number is then compared to the values on the scenario’s Kill-O-Meter. The meter provides a number range that indicates how well the players did, using a simple scale of Low/Medium/High. When not playing a scenario, this value is only meant to suggest how well the players did. A higher Kill-O-Meter value indicates the players did a good job taking down the zombies before they were taken down. If playing a scenario, the final score and its associated Kill-O-Meter value determines how the scenario comes to an end. Note that there are no “good endings”. Normally, the zombies are just moved forward and attack blindly. Using the Zombie Player variant, one player can take control of the zombies and determine how zombie behave in the game. This makes the game much more competitive and allows for up to 3 players (2 Human players and 1 Zombie player) to participate. The game can also be expanded to include up to 5 players (4 Human players and 1 Zombie player), which allows for the larger scenarios to take place. A second copy of the game is necessary to play this game variant. Lastly, for easier games, the players are welcome to remove some of the “No Luck” cards from the Fate Deck. We’ve only scratched (not bit) the surface of this game, and for reasons of saving time, we did not cover everything. To learn more about If I’m Going Down and read the full rules, visit the game’s official web page. I was passed this game by the designer, Mr. A. J. Porfirio, at Gen Con 2012. It was a pleasure to meet him and talk about our passion for games and family. I walked away with this game under one arm and didn’t have a chance to look at it until later that afternoon. When I did, I was blown away. Two thoughts immediately jumped into my mind. First, I was very much in love with the illustrations and the format. Simply excellent detail and a real eye towards the horror of the zombie genre. Gore and the indescribable mockery of life that all zombie fans know very well was captured perfectly in the horrific images. The zombie lover in me jumped for joy. Second, and following only a heartbeat or two after my euphoric zombie lover moment, came the crashing parental disappointment and alarm. This was a game I could not – would not – show to my little geeks for years to come. The artwork was the stuff of Child Geek nightmares. Undead clowns, flesh-eating grannies, and other grotesques jumped out at me and I shuddered to think of the many long nights I would have to spend on the floor of my children’s bedroom to help them fall asleep. No, sir, this was not a game that was going to be played by my children for a long while. My oldest, at age 8, could handle the game play, but I know some of the artwork would bother him. As for my 5 and 3-year-old…well…I hope they don’t find the game box and look inside anytime soon. In this case, I think the recommended age for the game is exceedingly appropriate. Not because of wordage or game play, but because of the visual representation and lack of any semblance of a joyous game ending. So that leaves the Parent and Gamer Geeks for me to test with. Not a bad lot, mind you, but I don’t think this game will do much for the Parent Geek group. This game always ends in death and dismemberment. Not a very uplifting game, and you won’t be high-fiving your partner afterwards. There is also the fact the game is pretty much a 1 to 2-player experience, with a possible 3rd if using the Zombie Player variant. That really doesn’t allow for group or family play. However, we’ve had a number of 2-player games in the past be approved by the Parent Geeks, but this one…I don’t know. I’m not getting a warm fuzzy off it. As for the Gamer Geeks, I think they’ll be somewhat underwhelmed by the card driven game play. The game doesn’t allow for much in the way of strategy or tactics. In fact, the only real choices the player needs to make is basically shoot now or later, with some resource management, ducking, and dodging added in. Goodness, so where does that leave me and this game? Ah, I know! The ZOMBIE LOVERS! I have a number of those I count as friends; I bet they’d like to try this game out. Some are non-gamers, though, which might prove to be a problem. Wow, I really have no idea how this game is going to end up. I guess we’ll just have to play it and see. My first test group was another Gamer Geek. 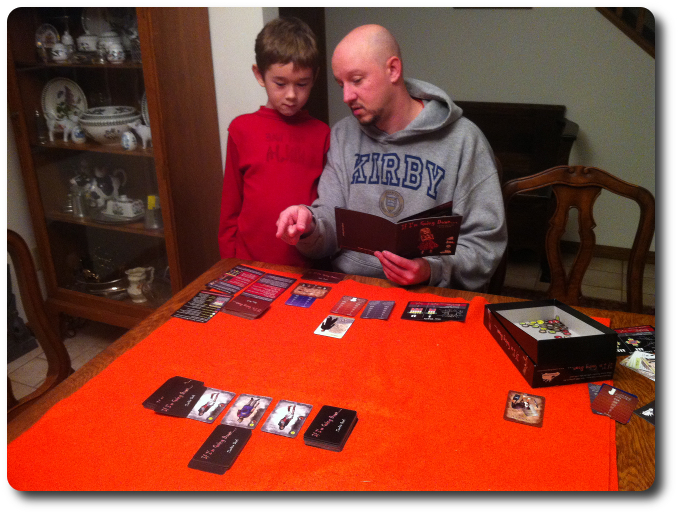 After I explained the game to him and answered any questions, we played a 2-player game. Before we cocked our guns and took on the undead, I asked him what his thoughts on the game were so far. Well, he’s right about his chances of survival, which are exactly zero. Let’s see how he feels after pumping some lead into the zombie masses that are quickly approaching. The game started out pretty blah. We flipped a card, shot a zombie, and then did it again. And again. Then things got interesting. We ran out of ammo and had to start digging for more gear. We failed to do much in the way of searching for resources early on because it wasn’t very difficult to take out the zombies that approached. Now we were out of ammo and out in the open. We were, in a word, stupidly overconfident. We quickly started to get overwhelmed and then I was taken out, leaving my friend to now contend with my undead version as well as the many zombies still shambling forward. Two rounds later, his character was being eaten, too. We both just looked at each other and smiled. “Again?”, I asked. “Hell, yes!”, he exclaimed. Parent Geeks did not ask for a second game. If I’m Going Down was not loved by the Parent Geeks at all. In fact, one Parent Geek said it was the worst zombie game they had ever played. I thought that was a rather brutal comment and asked for more detail. That’s when they told me they had only played one other zombie game, Zombies!! !, which I really don’t consider a fair comparison. Long story short, those Gamer Geeks who liked a good zombie game enjoyed If I’m Going Down, and everyone else…not so much. Gamer Geeks, this is a game you are only going to appreciate if you appreciate zombies. If I’m Going Down is the complete opposite of your typical a zombie survival game, as in, you won’t survive. You start out dead, but don’t know it yet. The game is not about trying to outlast, but out distance fate for as long as possible. But fate will catch up and when it does, you will be eaten. For individuals who like zombie survival games full of tactics and strategy, with complex and meaningful movement with resource management playing a major role, If I’m Going Down will disappoint. This zombie game is stripped down to its very basics and is only meant to represent that final moment when reason and a calm have been replaced with fear and the overwhelming sense to survive. Very visceral and very unforgiving. Child Geeks, NO! NO! NO! NOOOOOOOOOOOOOOOOO! If I’m Going Down is simple to play without being a simple game. The choices a player needs to make are boiled down to either shoot or don’t, and then a flip of the card determines the outcome. On the surface, this is rather “ho-hum” and doesn’t do much to tantalize anyone. Play one game, however, and you walk away a bit sweaty. The game is intense and never lets up. Playing solo is downright brutal and playing with friends only prolongs the inevitable. The game is designed to take you over its knee and give you one hell of spanking. For Gamer Geeks who love a good zombie game, this will certainly please and frustrated. If I’m Going Down is not a game you can win or survive, which is something of a first for me. You are meant to eventually (and horribly) perish. The only goal of the game is to take out as many of the undead as possible before they take you down. As odd as it might sound, this game is very liberating. Most zombie survival games are all about, well, survival. This one is all about doing as much shin kicking as possible before you are overwhelmed. It’s a different approach to what some would consider an overplayed and overdone theme and game genre, which makes it unique among the many, many games about zombies. That, in itself, should be enough for many zombie game enthusiasts to give it a shot. Personally, I rather enjoyed it, but let me add heaps of salt to this comment. I am a fan of zombie games. I love zombies. I do not find them depressing, I like pretty much every zombie movie I have ever seen (yes, even the really bad Italian ones), and have always been drawn to the idea of the shambling dead. Everyone has a favorite. Some like magical little ponies and others like Japanese robots. I like ravenous undead. In my opinion, If I’m Going Down was made for individuals like me and NOT everyone else. Even players who like zombie games might be turned off by If I’m Going Down. You will never “win” and will never “survive” any game. Each play session should be thought of as that last moment when a survivor has fought long and hard through countless zombies only to have their back pushed against the wall and run out of ammo. In other words, they are dead meat. No escape helicopter, no last minute action hero, and certainly no salvation. The game is fast and doesn’t give players much room to maneuver. This is done on purpose, and within the context of the game, works. But for those of us who like a good zombie story, this game captures those final moments of a true survivor’s last fight, perfectly. The scenarios provide for interesting stories and the game captures a time when strategy and tactics are useless and all that matters is pumping as much lead into as many zombie heads as possible before the gun goes “click-click-click”. Very awesome. But not awesome for everyone. If I’m Going Down is not what I would consider a game for a “wide audience”. In fact, I’d strongly suggest that this game NOT be “the zombie game” that you put in front of a new player who is not familiar with the genre. It is too dark, too final, and too predictable. It’s not an uplifting game or experience. For those not familiar with zombie games or lovers of zombies films, this game will be a huge disappointment. 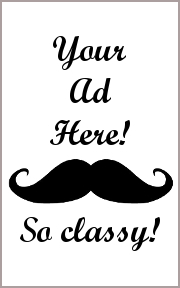 Before you put this game down on the table, know your audience. So, where does that leave us? If you are a lover of zombie films, games, and anything else you can think of that has “zombie” in the title, you’ll enjoy this game. To what degree is going to depend on your fascination and enthusiasm of the genre. For everyone else, stay away. Stay far, far away. This game has teeth and won’t let go. It was designed to eat you. If you can’t handle that, there are many other games waiting to be played. If you can handle it, step up and bring your game face, because it will be the last thing you wear before it is ripped off. Tagged Gamer Geek Approved, Horror Games, Zombie Games. Bookmark the permalink.